It will soon be Burns Night where loads of events and suppers will take place to celebrate the Poet Robert Burns. January 25th will see lots of Scottish Costumes, Kilts and Tam 'O' Shanters being worn. We have looked at a bit of the history of Burns Night and how this day is marked with festivities, Scottish Flags and Red and Green Balloons. We would love to know how you will be celebrating Burns Night. Burns Night is the celebration of the great Scottish poet Robert Burns. He not only wrote famous poems like Tam 'O' Shanter but also improved songs like the well known Auld Lang Syne. 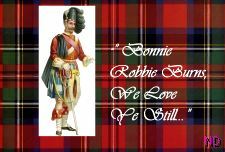 Burns Night takes place on 25th January which was the birthday of Robert Burns. The customary way to celebrate is with a Supper with family and friends where often traditional Scottish Costume is worn which includes Kilts and Hats. Decorations also consist of Red and Green Balloons and Table Flags. A big event will also usually start with a Piper to welcome guests who will play until guests are seated. The first suppers were held in Ayshire at the end of the 18th Century by the friends of Robert Burns on the anniversary of his death. Will you be celebrating Burns Night? Are you having or going to a big supper?